… with this catchphrase we are once again beginning the collection of 1% of income tax donated by our Fans and Supporters. Thanks to your generous support, we managed to receive a further subsidies worth total 140 thousand PLN. The money were mainly devoted to general repairs of Shed’s buildings. 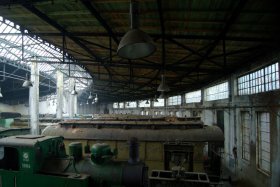 Thanks to the 30k PLN received from 1% tax donations the roundhouse of the shed gained 900 square meters of brand new roof. Last year’s repairs brought us closer to the final goal of complete revitalization of Shed, yet there is still plenty to be done. To own an engine shed is a great satisfaction, but also a great responsibility because it is our duty to keep the Shed in shape. This is why we continue to ask to remember about us when it comes for you to decide to whom donate your 1% of income tax. We are still far from refurbishing each and every exhibit in our shed but at least we are close to providing the retired vehicles a proper and warm storage place and organize our workspace for even broader renovation works. Our plans for the nearest future are concentrated on steam engine class Ol49-4 and beer refrigerator car.